The Habs were back on the ice at the Bell Centre on Tuesday as they faced the Ottawa Senators for the second time this season. After strong starts, both young squads have cooled off lately but remain in the thick of the playoff picture and are very close to one another in the standings. The Sens won the first duel 4-3 in overtime in Kanata, so the Habs could use that as motivation for this game. They could also lose the much fresher loss to the Sharks, as the Sens were coming off a 6-2 win against these very same Sharks. The goaltending duel remained a familiar one with Craig Anderson facing off with Carey Price. The blue line remained the same as it was against the Sharks, while Matthew Peca drew back into the lineup in the place of Nicolas Deslauriers. It was an evenly played contest overall, but a dominant performance by Max Domi and Jonathan Drouin simply were not to be matched, mostly taking advantage of the last five minutes of the second period to bury the Senators and skate away with a convincing 5-2 victory. The Domi line was aggressive on the opening shift. Claude Julien saw this aggressiveness from his top unit and quickly deployed them a second time before the two-minute mark had expired. This second expedition was much more difficult as a series of giveaways by Shea Weber and Brett Kulak forced Price to come up big early. Just after the five-minute mark, a Weber wrist shot created a rebound that Andrew Shaw just couldn’t get to. On the same play, Drake Batherson planted an elbow into Shaw who did not yet have the puck. Domi took exception and immediately jumped on Batherson. The penalties doled out on the play were appropriate as Batherson was given a minor for interference and Domi was given four minutes for roughing, thus the Sens would see the first power play of the night. The Canadiens were able to effectively kill the penalty without allowing a high danger scoring chance. As the midway point of the period neared, Mark Stone was penalized for kneeing Jonathan Drouin. The Habs man advantage was not able to get on the board though it generated momentum through zone time. After the penalty, a solid defensive play by Matthew Peca sent Drouin and Domi off to the races and they capitalized on their 2-on-1 chance when Domi made a sweet pass across and Drouin beat Anderson through the five-hole. The Senators tried to reply immediately as they pressured the Jordie Benn-Mike Reilly pairing who needed to be helped by Price on the sequence. While the rest of the period remained scoreless, the penalties were numerous in the final minute. The first two were offsetting as Michael Chaput was called for holding Colin White while Brady Tkachuk slashed Reilly. A third penalty was called with four seconds to play when Brendan Gallagher held Thomas Chabot. 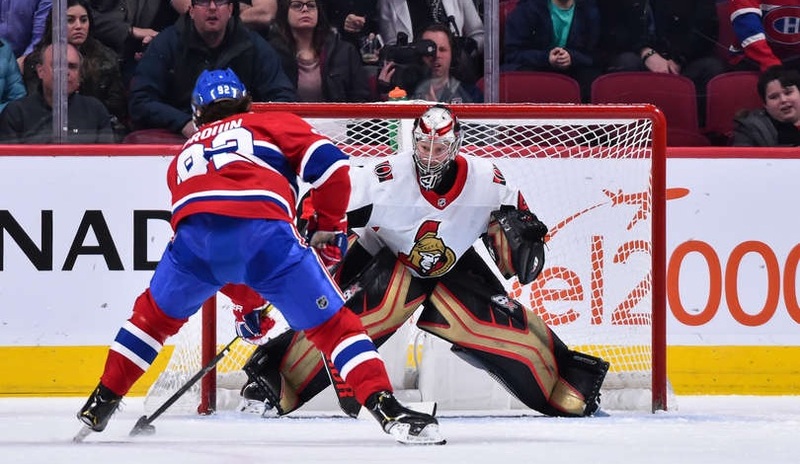 The Senators started the period with a 90-second 4-on-3 advantage which they could not use to tie the game though they did hit the post on the sequence. A few moments later, Chris Tierney tripped Drouin as the Habs would get their second power play of the game. Once again scoreless, this attempt was much less convincing than their first one. The rest of the first half of the period was played on the perimeter by both teams until Domi and Colin White exchanged good scoring chances with approximately 12 minutes to play in the period. The Senators would finally tie the game just before the half of the period when Jesperi Kotkaniemi lost his faceoff after an icing. The puck went to Dylan DeMelo whose shot from the blue line deflected off Paul Byron to beat Price. 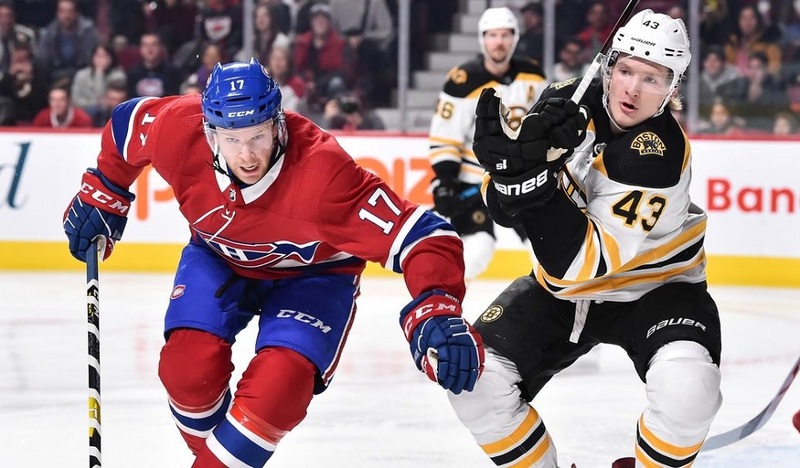 After five minutes of timid play by both teams, the Habs dominated the final five minutes, taking a 4-1 lead before the end of the period. The first goal came with 5:22 to play as Drouin intercepted a clearing attempt to find himself on another odd-man situation with Domi. Drouin returned the earlier favour and teed up Domi for a laser to the top corner. Less than three minutes later, the duo was at it again when Drouin skated the puck up the ice before executing a drop pass to Domi who quickly released a shot that fooled Anderson. That play was started by Byron who was suddenly on this line. Less than a minute later, the other half of the Julien line shuffle was successful. Shaw skated the puck up the ice before finding Kotkaniemi. Kotkaniemi was covered, but he fought off the defender and made a sublime pass across the crease to Artturi Lehkonen who simply had to redirect the puck into the open net as the Habs suddenly headed to the third with a comfortable lead. 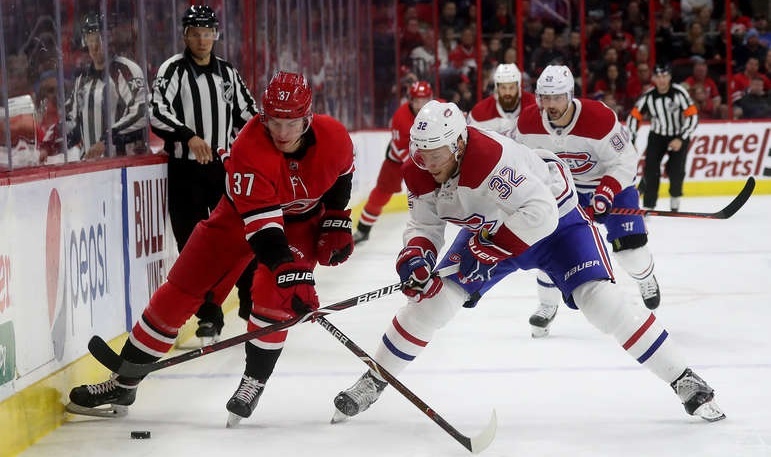 The third period started with the Habs taking advantage of the young Senators defencemen who were cheating offensively to try to get back in the game. On the opening shift, Domi was able to skate down the ice and missed Petry’s stick by an inch for an easy tap-in. After a few pushes by the Sens were handled by the Habs, it was the home team scoring as Tomas Tatar picked the pocket of a defender in the offensive zone and found Gallagher in the high slot who shot immediately, beating Anderson to the far side. Immediately after the goal, Kotkaniemi was sent to the penalty box on a ghostly hooking call. It did not matter as Danault and Lehkonen created the best chance of the sequence. With the Habs looking to not give the Sens any bulletin board material heading to Thursday’s rematch, Montreal played safe and boring hockey. The Sens rolled out some rough stuff, trying to do the exact opposite and get amped for the rematch. After a solid hit by Kulak, Ryan Dzingel came after him and a rather mild fight broke up between the two players. With 7:30 left to play, a soft zone clearing attempt by David Schlemko (who had been playing well up to this point) resulted in a turnover. With Petry and Peca both covering their players, Matt Duchene was able to find Stone alone in the slot as Schlemko did not cover his man. Stone, being the sniper that he is, took advantage of the space given to him to beat Price and make it 5-2. The last five minutes of the game was without event, resulting in a comfortable win for the good guys. It wasn’t a true Gordie Howe hat trick since Batherson didn’t drop the mitts, but it was pretty close since Domi did drop them. Some fans might not like it, but Domi appears to be at his best when someone engages him emotionally and he plays on the edge. The early play against Batherson appeared a little silly by the Habs top pivot but it got him in the game and this was his best in the last few weeks. Speedy and in the Senators faces all night long, this is the Domi the Habs will need to see with regularity if the playoffs are to be an achievable feat this season. Stats: 2 goals, 1 assist, +3, 4 shots, 16:09 T.O.I. Unlike Domi, Drouin focused on hockey and for a player with his skill and creativity, he took advantage of the numerous times the Senators defencemen gave him way too much space to operate. The result was a three-point night and other highly dangerous scoring chances. When Drouin plays with speed and skates into the open spots on the ice, he almost always looks like a player that could score 90 points in a season. Stats: 1 goal, 2 assists, +3, 3 shots, 17:26 T.O.I. Remember when Weber made Alexei Emelin look like a top-pairing defenceman for large stretches two seasons ago? One has to wonder if this is what is going on. Kulak is controlling his gap, making the right decisions with pinches, and being physical enough to warrant his spot next to Weber for the time being. If he continues to play like this, his ideal spot may end up being next to Jeff Petry on the second pairing. If this is really the scenario that plays out, Marc Bergevin will have filled an important spot on his depth chart with another cheap purchase from the Calgary Flames. Buyer beware though, the sample size is ridiculously small up to this point; Jordie Benn looked about this good in his first 20 games in Montreal too. Regardless, he’s been a pleasant surprise thus far. Stats: 0 points, +2, 3 shots, 2 hits, 16:31 T.O.I. The saves on this night weren’t numerous, weren’t as dangerous as they were pre-Weber, and they definitely were not flashy. However, some of the saves made by Price were important, timely, and Price made them look easy. More of this from the all-world netminder will once again have the doubters feeling silly by the time the All-Star game rolls around. Stats: 28 saves, 30 shots, .905 sv %, 2.01 GAA, 59:37 T.O.I.